Keep it clean. Good fireplace maintenance starts with a clean fireplace. When your fireplace is cool, sweep or vacuum out cold ashes from your wood burning fireplace. It’s always a good idea to wear a mask to keep from inhaling the dust. Hire a chimney sweep. Sweeping out the ashes is just the tip of the iceberg when it comes to keeping your fireplace clean. There are lots of nooks and crannies you can’t see. 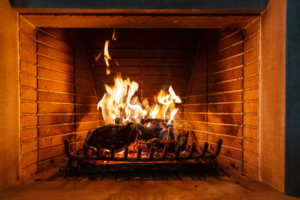 An annual inspection and cleaning by a licensed chimney sweep is essential for wood burning fireplaces, but you can go longer between inspections on a gas fireplace. In either case, it’s a good idea to get it on your calendar now and ask to be set up for recurring service as recommended by a professional chimney sweep. Your chimney sweep will inspect both the fireplace and the chimney for cracks and loose or missing bricks or mortar as well as scrub away any creosote build-up. Gas fireplaces need different attention. If you have a gas fireplace, you won’t have as much weekly fireplace maintenance to do in terms of sweeping, as they don’t produce the ash that wood burning fireplaces do. However, you’ll need a technician who specializes in gas fireplace maintenance to check your gas lines and ensure that there are no leaks. Understand your damper. Your fireplace damper is simply a flap that opens and closes to release smoke through the chimney when you’re burning a fire and keep out the cold outside air when you’re not. Never start a fire with your damper closed, as it can cause the backup of harmful smoke in your home. And, make sure your damper is inspected along with the rest of your fireplace on a regular basis. Use a guard. Your fireplace should be equipped with some kind of guard–either a screen or heat-proof glass doors. Never use your gas or wood burning fireplace with the glass doors closed because the heat build-up can cause them to shatter. If your wood burning fireplace has a screen, pull it closed while you’re using your fireplace to prevent embers or logs from falling onto the hearth or carpet to avoid potentially causing a house fire that could result in the need for fire and smoke restoration. Use the right wood. Choose seasoned firewood for the cleanest and safest burn. Wood that’s damp or too green will create unwanted smoke with less heat. Smoke, like mold, contains tiny particles that can cause or aggravate respiratory issues. Hardwoods like oak, birch, beech and maple are great choices for high heat and minimal smoke. Clean your cover. It’s important to keep your cover clean, along with the other components of your fireplace. However, make sure that you are always using an alcohol-based product on your cover glass; never ammonia, as it has flammable properties. Check your fire and smoke detectors. No matter how safe and well-maintained your fireplace is, properly installed and working fire, smoke and carbon dioxide detectors are essential. It’s a good rule of thumb to change the batteries in all your detectors when you change your clocks in the spring. Fireplaces conjure up images of cozy nights, togetherness and comfort. Whether your fireplace is wood burning or gas, make sure it only creates happy memories by keeping it properly maintained. Should you ever experience fire or smoke damage from a fireplace issue or any other unexpected event in your home, contact a trusted property restoration service near you. The trusted restoration experts at Hays + Sons are just a phone call away, 24 hours a day, 7 days a week, 365 days a year. With offices throughout the Midwest in Fort Wayne, Crown Point, Indianapolis, Columbus, Muncie and Lafayette as well as Cincinnati, Ohio, there’s a Hays + Sons near you.